Is yeast ok as an ingredient on a kefir starter? Home › The Candida Forum › Candida Questions › Is yeast ok as an ingredient on a kefir starter? Thank you very much for all your advise, I would be lost without it. Quick question? Is yeast ok as an ingredient on a kefir starter package? Loren wrote: Hello everyone, Thank you very much for all your advise, I would be lost without it. Quick question? Is yeast ok as an ingredient on a kefir starter package? If your kefir brand is Body Ecology, then it’s fine, if not, post the brand name and I’ll check it out. The brand is “yogourmet”. It says Freeze-dried kefir starter. Able, thanks a lot for taking the time. You’re great!!! That’s a good brand as well, Loren. Believe it or not, there is actually such a thing as beneficial yeast, and this is the type that’s placed in the kefir starters. You’ve probably heard of Brewer’s yeast, this is one example of beneficial yeast. The ”good” yeast that’s added to the kefir starter give the fermentation of the kefir a kick start, so to speak, getting the fermentation process off to a good start. The beneficial yeast also supply a by-product which feeds beneficial bacteria such as Lactobacillus bacteria that are normally a predominant strain in kefir. I’ve been using Yogourmet for some time now. It’s pretty good, and I’d like to think somewhat of a help. It doesn’t taste particularly great, but I make a “smoothie” out of it with coconut flour, flaxseed meal, glutamine, oatbran, stevia, cinnamon, ginger, and a little water or almond milk. Comes out pretty tasty that way. Give it a shot. The time it takes you to make kefir from a starter is about the same ammount of time it would take you to make kefir from grains. the benifits from grains are superior to any starter you will get. Moreover if cared for your grains you can maintain the grains you purchased once for the remainder of your life. If you get tired of taking care of them ever day or two then just dry and store them till your ready to do it all over. I highly reccomend you buy kefir grains. You can find them on amazon cheap. Or you try the kefir lady>still cheap. Here is a couple videos, one on how to make milk kefir nice and easy, and another of someone making water kefir. If I buy kefir grains, do I also need to buy a mesh strainer, sprouting strainer lid etc? A strainer makes things a lot easier. I have seen videos of folks not using strainers, some use forks to pick out the grains; I saw one where the kids were using their hands to get all the grains out. A strainer works for me. Which you see in my second picture. I just take a wooden spoon that is clean and sterile and stir the kefir in the jar, then poor it into the strainer which sits on top of a container that is easy to poor liquid out of. 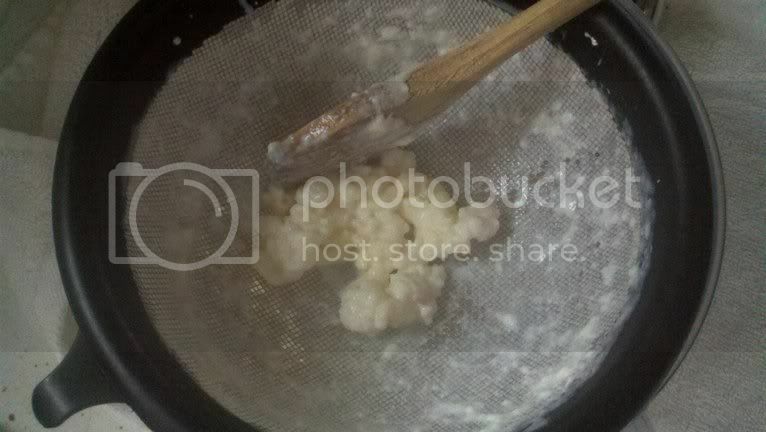 Then I stir the thick kefir around till only the grains are left like in the second picture. In this picture I show you what I grow my kefir in. 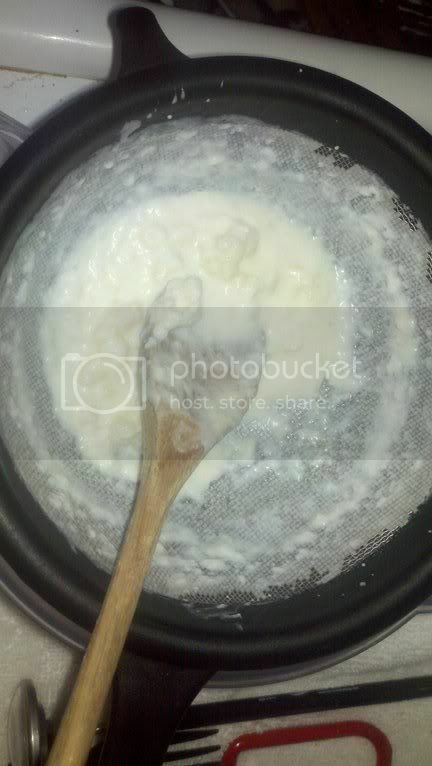 And the small strainer I used before. I still use the small strainer for my water kefir which by the way has no problem with a fine mesh. For the top of the jar, you want to allow air to get out but no bad stuff to get in so I use just a paper towel and rubber band. Easy. After the kefir is strained, for the milk I store in a plastic container in the fridge. I just keep adding to any left over from the previous batch. This act kind of like how it was originally brewed by the folks in the caucus mountains. Its a form of continual fermentation but by no means necessary. You can clean and use a new container each time. For my water kefir, I use the 1 gallon spring water jugs. I strain out the water kefir, remove the grains and put them back in my growing jar. I add water from the jugs to the growing jar, and then I take the strained kefir and put it in water jugs. I let mine sit out for another 48 hours then put it in the fridge. This last step is not needed either but I like mine with the least amount of sugar and the most amount of fermentation I can get. 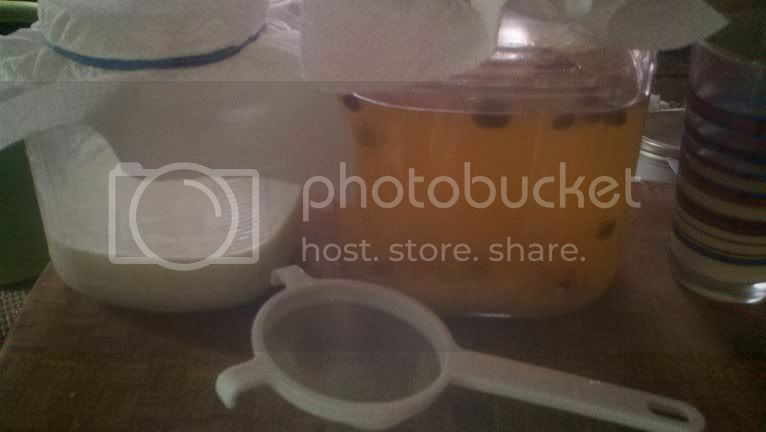 Here is a picture of my water jug with my last batch of water kefir on its second fermentation. It’s best to use glass containers because plastics can leech out of the containers; kefir has a strong ability to absorb other materials. raster wrote: It’s best to use glass containers because plastics can leech out of the containers; kefir has a strong ability to absorb other materials. Thanks! 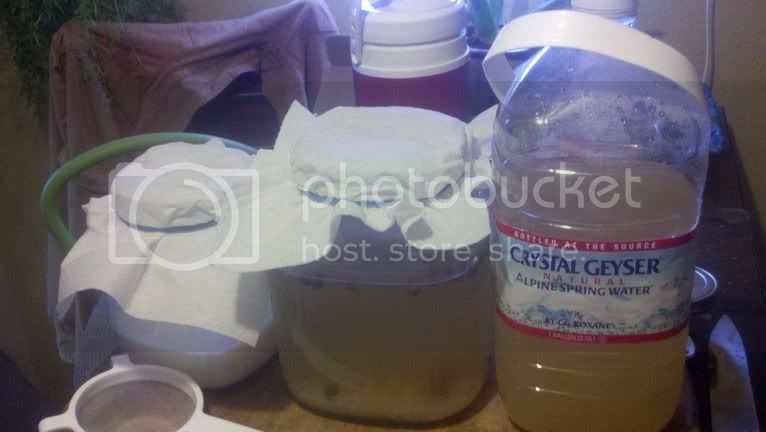 I dont think my water kefir is an issue because Its only in the jugs for 4-6 days before im on to my next jug of water. But my milk kefir in the fridge might be an issue. I will switch to a glass one. Thanks for the tip! So I was looking up the plastic issue, I hae heard of plastic leaching before but at the same time i have never seen kefir sold in glass containers either. My question is: Is the stronger the kefir the better for you? Because I like mine mild. I let it sit for 12 hrs only. Is this okay or should I let it ferment more to get more benefit? mariegirl wrote: My question is: Is the stronger the kefir the better for you? Because I like mine mild. I let it sit for 12 hrs only. Is this okay or should I let it ferment more to get more benefit? It should be fermented for at least 24 hours to allow for grains to eat all the sugar. You can experiment with the amount of grains and milk. If you have more milk, kefir is a little milder. Every time my kefir gets too strong (and I can handle it pretty strong), I toss out half of my grains and then it gets milder and thicker for a while. The topic ‘Is yeast ok as an ingredient on a kefir starter?’ is closed to new replies.